Gadacz, René R.. "Quillwork". The Canadian Encyclopedia, 08 February 2017, Historica Canada. 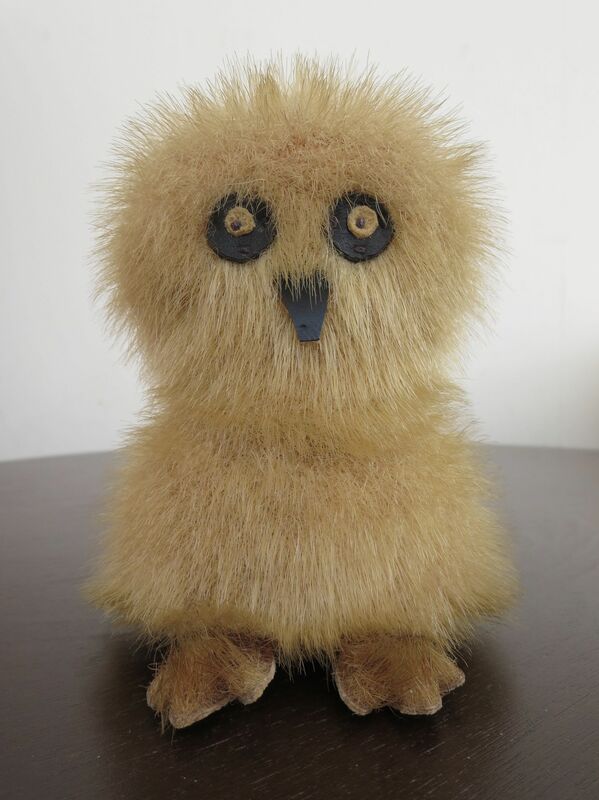 https://www.thecanadianencyclopedia.ca/en/article/quillwork. Accessed 19 April 2019. There were four uses for using dyed porcupine quills - sewing, weaving, wrapping and pushing into tiny bark perforations - though sewing was the most common method. 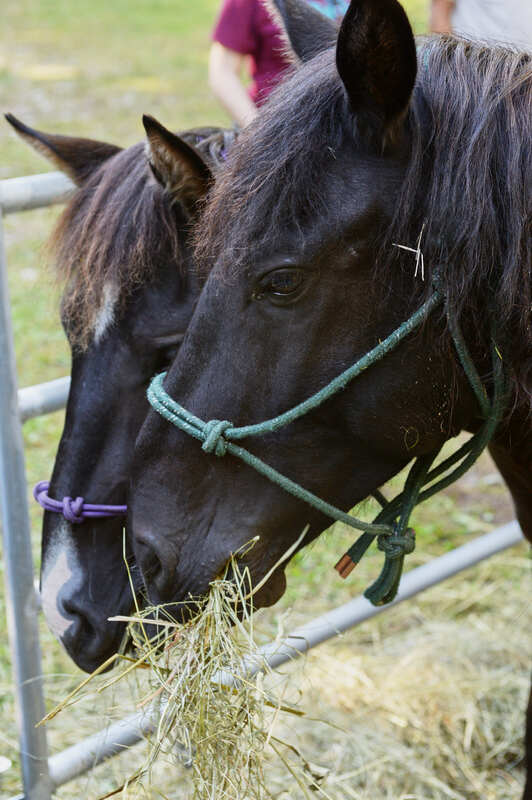 Quills were moistened to make them pliable and flattened by drawing them between the teeth or over the thumbnail. 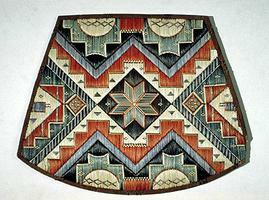 Micmac quillwork chair seat (courtesy Glenbow Museum/Canadian Ethnology Service, CMC). 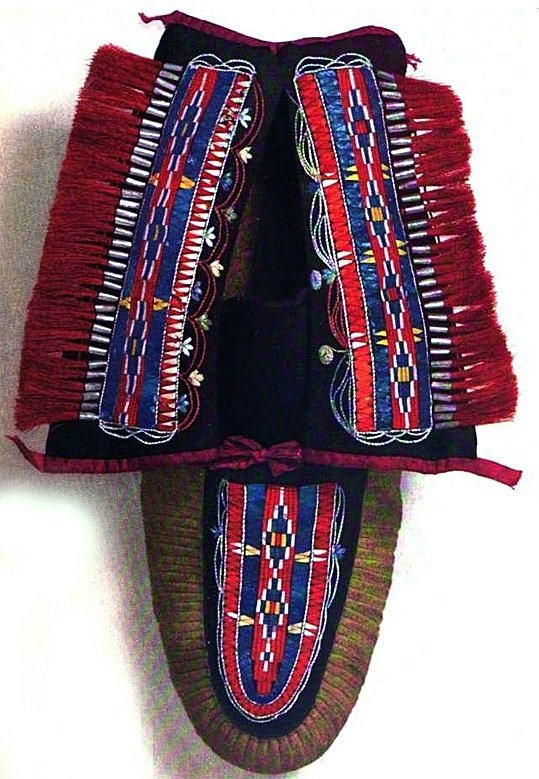 Huron moccasin featuring quillwork (1918). 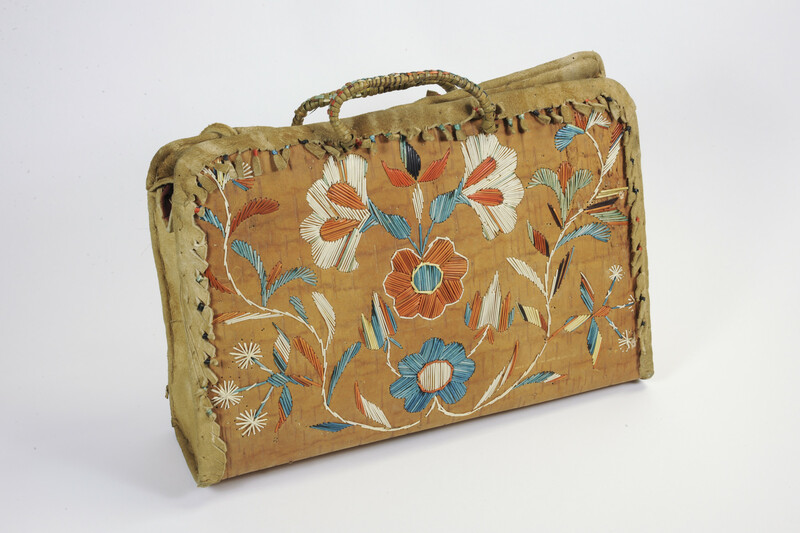 Eastern Woodlands First Nations birch-bark handbag with buck skin sides, lined inside with red velvet and embroidered in quillwork on front with floral spray; two handles of green quill work (faded). \r\nPresented to Prince Albert Edward (future King Edward VII) in 1860. Quillwork included decorated buckskin clothing, birchbark boxes, calumets, knife sheaths, medicine bundles, parfleches, drums, tipi covers and moccasins. Widespread in Aboriginal North America and highly developed among the Plains people, porcupine quill embroidery was done by women. Among the Cheyenne the club of robe quillers was a women's association. There were four uses for using dyed porcupine quills - sewing, weaving, wrapping and pushing into tiny bark perforations - though sewing was the most common method. Quills were moistened to make them pliable and flattened by drawing them between the teeth or over the thumbnail. Thin strips of sinew were used as thread. 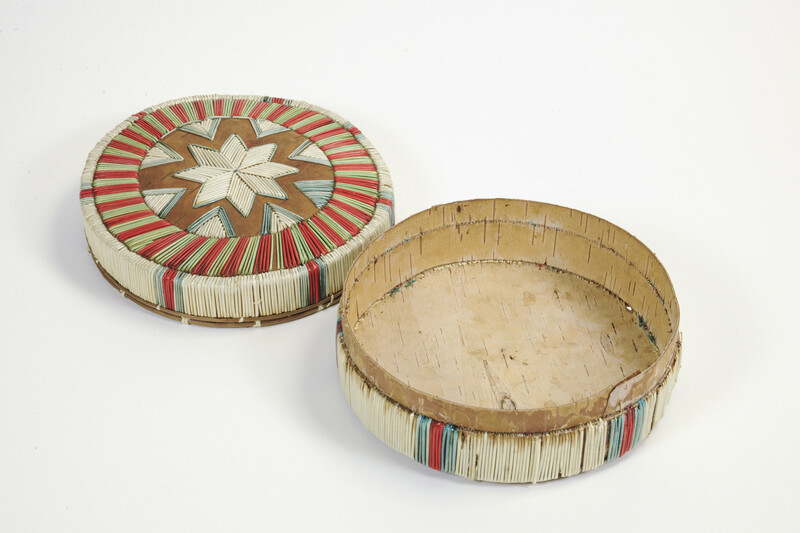 Among older western Cree articles, quills woven with sinew strands without a hide background and then attached to the item were almost always of angular geometric design. After European contact quills were replaced by glass trade beads, and geometric designs were replaced by human and animal figures and floral designs.